Boom Mat Spray-On sound deadening is perfect for reducing unwanted road noise and deadening vibrations in those hard to reach places such as trunk interiors, fender wells, undercarriage, body panels, rear quarters and inside door panels to name a few. Boom Mat Spray-On also serves as a thermal barrier insulating against unwanted heat. Whether you are looking for a quiet ride by eliminating squeaks, rattles, vibrations and unwanted engine and road noise, the benefits of Boom Mat Spray-On sound deadening can be used on any vehicle. 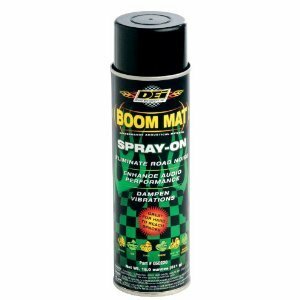 Boom Mat Spray-On can be applied in multiple layers for even more sound deadening while handling temperatures up to 300 degrees F. Can be applied to non-coated surfaces and can be top coated with paint after only 6 hours of dry time.